GateHouse Media and its parent company, New Media Investment Group, is operating with strong cash flow. the company is paying dividends to shareholders and buying new properties left and right. But it is taking a taking a hard “no raises” negotiating line in contract negotiations at the State Journal-Register and Pekin Daily Times — even though veteran journalists at both newspapers have gone seven years without a raise. So many of our members at both newspapers staged informational pickets at lunchtime Monday. Members of the labor community and other civic activists joined them on the street in solidarity. Influential media blogger Jim Romenesko wrote about the plight of our Springfield chair, Dean Olsen, who is just one of the many GateHouse employees who have had to take a second job to make ends meet. The Illinois Times provided advanced coverage of the Springfield protest and described the ongoing fight for a first contract. 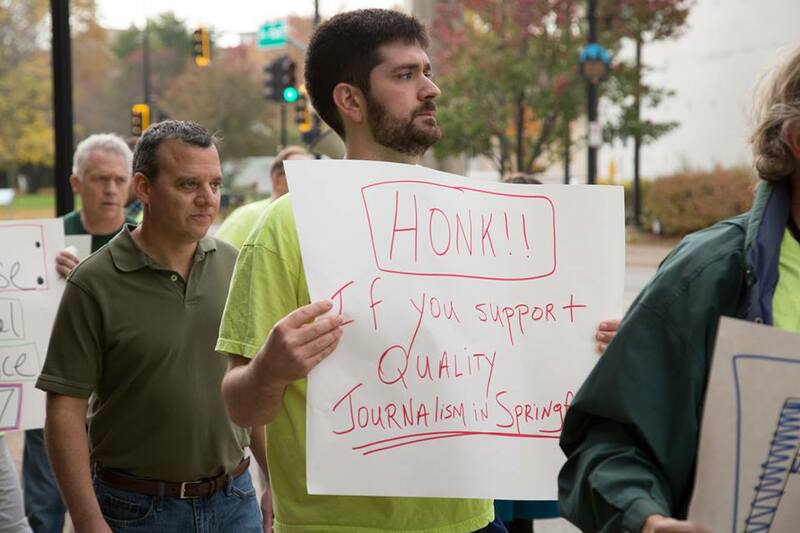 Our protest in Springfield drew television coverage, helping spread the word about what GateHouse has done to journalism in the state capital. 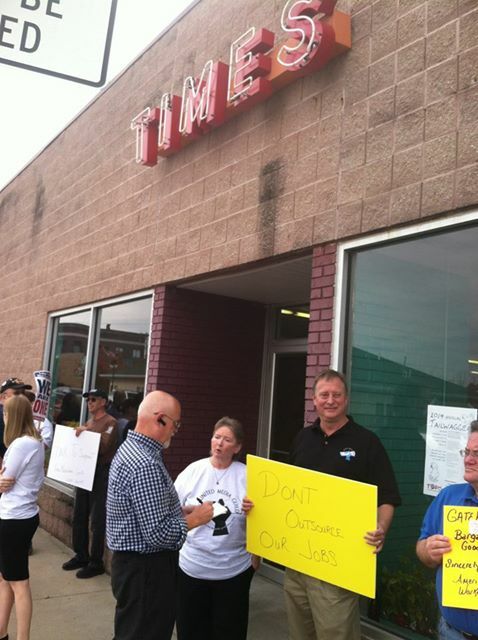 Our protest in Pekin drew radio coverage, letting folks know that many journalists at that paper do not make a living wage. Reporters start at $10 per hour. In Rockford, our members at the Rockford Register Star launched its outreach campaign “Transform Rockford Register Star” by reaching out to those in the “Transform Rockford” civic movement in that community. They are building an e-mail database of Rockford leaders and civic activists to spread the word of what GateHouse Media has done to the Register Star since buying the newspaper. The Register Star has been strong advocate of the “Transform Rockford” movement, yet its parent company has been a terrible corporate citizen in that community. GateHouse Media pared the newsroom to a fraction of its former size and shipped many jobs to Texas.